While digital consoles still require clients to make a significant financial investment, the conveniences they offer have resulted in a definitive shift from analog systems. Today, manufacturers continue to produce this technology for high-end live sound and permanent installation applications. However, they are also pursuing the development of systems for more modest budgets. "The shift to digital has been very rapid," observed Dave Neal, director of marketing communications at Soundcraft in Potters Bar, Herts, U.K. "A lot of people are seeing the advantage of digital with recallability, as well as integration of outboard equipment, compact size, and so on. Despite the learning curve that people must go through, they are seeing some significant benefits." Matt Larson, U.S. sales manager for Midas USA and Klark Teknik in Burnsville, MN, noted that while the majority of digital consoles were initially designed for high-end touring acts and Broadway-style productions, the religious market is also embracing digital consoles to a considerable degree. "We have found that the church market in some areas of the United States are demanding this technology more than even some Broadway engineers, and the Broadway engineers are using it to the fullest extent," he said. "The amount of inputs that are needed for some houses of worship is sometimes more than 20 percent above the average mic input count over some of the Broadway shows." One of the main challenges associated with the operation of digital consoles is building-and operating-the user interface, which often groups several functions into just one button. "In production, issues such as multichannel surround and resource sharing are the current technological challenges," observed Niall Feldman, director of product marketing at Solid State Logic in Begbroke Oxford, England. "The technical principles are well understood, the challenges are in delivering these benefits without it all getting too complicated to understand." Manufacturers are aiming to make things easier, however. Feldman outlined SSL's approach: "SSL's latest digital consoles have features that allow a single set of channel controls to manage an array of related controls: one audio fader, EQ, and so on, actually controls six other faders," he explained. "With clever control, it's easy to break this out over a number of separate channels, then fold it back again." "The mixing engineer should be concentrating on mixing the show, not programming it," Larson explained. The Midas XL-8, released earlier this year, is the manufacturer's first foray into the realm of digital consoles, and was designed to offer engineers a work surface that was quick to learn and easy to operate. Its Linux-based, forward-and-backwards-compatible, open architecture facilitates the movement of data between consoles. "You can save your show, go to another place anywhere in the world, plug your show in, and it will be compatible because we are using a Linux system." The XL-8 is built based upon the AES-50 protocol, allowing for total phase coherency through the system. "There were many technologies that had to come into place for us to get to the sonic quality that we were looking for, and AES-50 is one of them," Larson said. "We can use some of the same technologies that are used in the XL-8 as we come down market with other models." 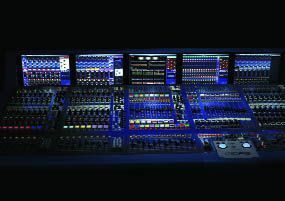 Soundcraft's Vi6, also shown for the first time at MusikMesse, is the manufacturer's first digital console, but incorporates technology that was developed years ago by its sister company, Studer, including a user interface based on Vistonics systems. The board, which, because of its alliance with Studer, is being referred to as a "third-generation" console, features 64 channels of input-to-mix capacity over 32 motorized faders, which can be assigned to 32 outputs (plus a stereo and mono mix) that can be configured into any combination of group and aux busses. Up to 16 matrix outputs can be taken from the pool of 32 busses. All functions corresponding to each channel strip are always on display, allowing for easier operation. "Analog consoles feature one knob per function; you have a set of knobs for EQ and a set of knobs for auxes. It's very fast to operate because you know where everything is, and you can get there immediately," Neal said. "Early on in digital consoles, the desks were assignable so you could change function on a knob according to what mode you were in. The user interface was a key element of that." Soundcraft has leveraged technological advances to provide a more intuitive user display. "Only as some of the technology has changed and become more cost-effective, manufacturers have been able to deliver touchscreen-based products. It is moving more towards one knob per function," Neal noted. Now, things are gradually becoming less computer-oriented, he added. While their main objective continues to be mixing a production, manufacturers have started to view their digital consoles as entire "systems." SSL's MORSE (modular resource sharing engine) technology, for example, enables users to expand on an as-needed basis, making a systems contractor's life a little easier, Feldman maintained. Networking has also become a priority: HiQnet, a proprietary networking system by Harman, is integrated into the Vi6. "Being able to sit at a console and send messages around a complete system, telling it to change particular equipment settings or recall routing and configurations is a trend that we have monitored, and hence the reason for the release of the HiQnet system," Neal explained. The decreasing cost of some consumer technologies is also enabling manufacturers of professional products, such as digital consoles, to construct devices that are less expensive, Neal observed. "Certain parts of technology are coming down in price all the time," he said. "As more technology is used in the consumer world, you get the benefits of economy of scale. If there is a component, or a particular type of device that becomes available to the consumer world, it's much more affordable because the consumer world is much more price-sensitive."